Flavoured water Ideas - ditch the sodas! Are you longing to get your kiddies off the sugary soda and pop? Scroll down and take a look at all the sugar-free flavoured water ideas that can make that a reality. On a summers day it’s nice to sit back with a refreshing drink but sometimes water can be, well, boring. 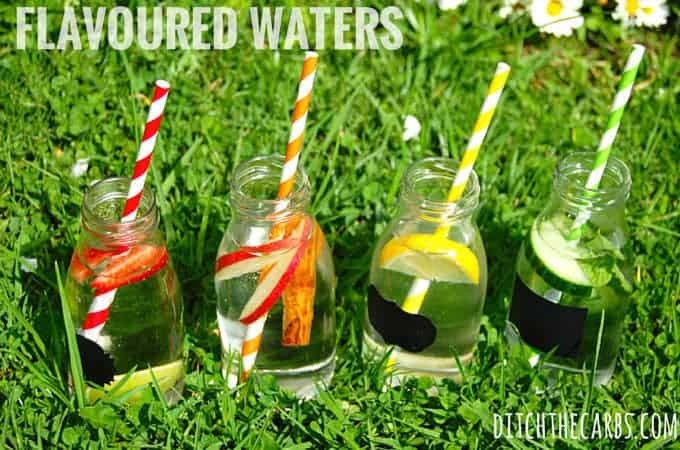 These simple flavoured water ideas turn plain water into something beautiful, refreshing and naturally colourful. After making these flavoured waters, I left my children with the chopped up fruit and herbs, then let them create their own bottle of magic. They were so excited to experiment with any whacky combination they liked and use their own bottles and straws. Flavoured waters makes it easier to drink more water, especially children. It is also a great way to get children off the fizzy drinks or fruit juice until they are ready for plain water. Say goodbye to bottled water and soft drinks. 90% of the cost of bottled water is to pay for packaging, distribution, shipping, marketing and then recycling. Use some of these flavoured water ideas to add to your water bottle at the gym or at school. 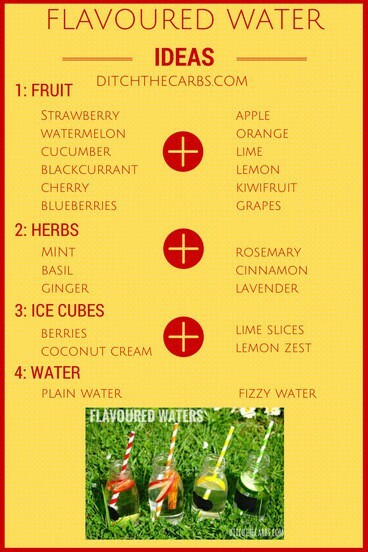 Don’t buy juice which has as much sugar as some soda drinks, or rehydration drinks, make these flavoured waters instead. No sugar, no waste, no recycling, inexpensive and healthy. And remember how much sugar is in a juice. As much as some sodas. Eat the fruit, not the juice, to get all the fibre and fresh nutrients. Take a look at sugarstacks.com to see how much sugar is in everyday food and drink. It’s an eye opener. 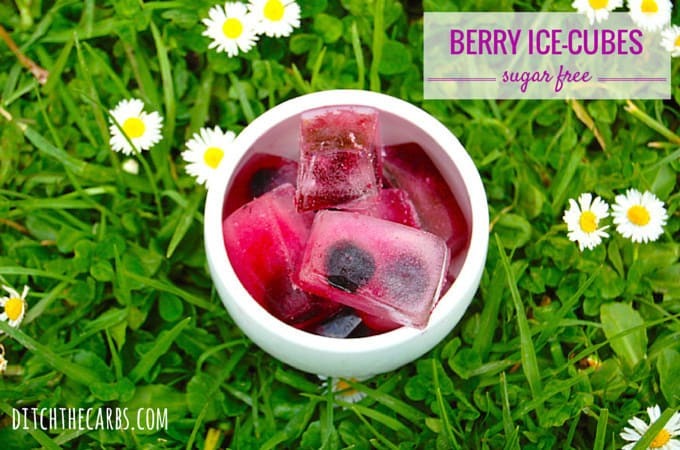 Transform ice cubes with berries. Just pop 2 or 3 berries into an ice cube tray and fill them with water. As each ice cube melts, the berry is released to eat! Experiment with freezing other fruit, citrus or herbs. 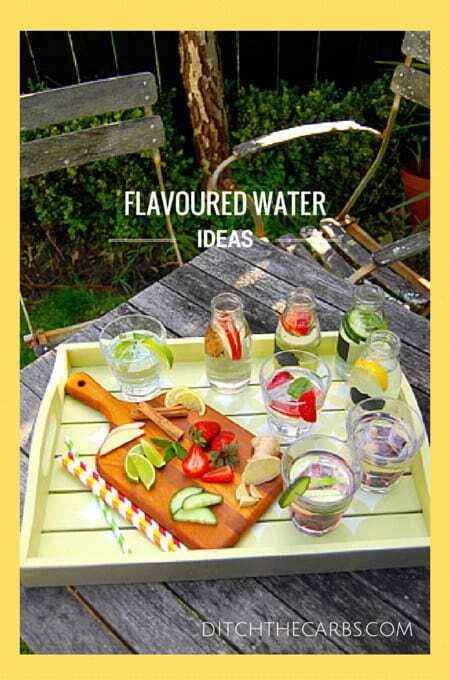 Use the chart for flavoured water ideas. 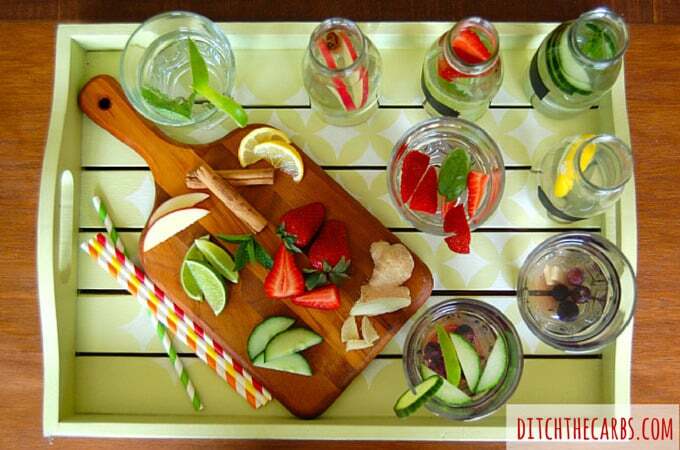 Choose your fruit, herbs, ice cubes then finally add plain or carbonated water. Write a comment below on your favourite combination of flavoured waters or any other ideas to give up the juice and soda. Have you joined my FREE Low-Carb Lunch Club? I help you make lunch boxes for school and work. Let’s make your morning routine a little easier. Great ideas. Please remind people that all those water inhancers like Crystal Light etc, which say zero sugar, are actually loaded with artifical sugars. The body is brilliant but does not differentiate fake sugars, real sugars etc. Although calorie & carb wise may look good, they will affect your insulin hormone. Unless you are eating the fruits and veggies, and you need to be incredibly strict with your carbs for medical reasons, then no, I wouldn’t count them. The beauty of living low-carb, I that you end up eating and drinking intuitively. I have had decades of counting points, calories, numbers, colours etc. And it is pure freedom to live low-carb. Many people count carbs at the beginning so they become aware of where their carbs are coming from, but eventually this will stop. There will be negligible carbs coming form infusing water, unless you crush berries, fruit and so on, then yes, there will be sugars released into the water. Orange zest is amazing. Almost zero carbs and really packs a punch of flavour. I also love cinnamon sticks, mint leaves, cucumber etc. If you drink water with citrus in it all the time it’ll erode the enamel off your teeth. Juice yes, a squeeze of one thin orange slice in a litre or water, no. I’m new to the Low-Carb diet, can somebody tell me how to make flavored water please? Do I crush to fruits and berries and such before adding them to the water? I want to try to get my son off soda, and I really believe this might do the trick. You can either crush the fruit or you can leave them whole so it looks pretty. I like to gently squeeze them so it’s almost half way. Awesome you are getting your son off soda. You may want him to watch my son’s science experiment where he boils soda and you can see how much sugar is in there. he may never want to touch it again. Hi Libby, I have just discovered the red seal cold brew teas. these say their sugar free, but have no nutritional panel… they are made of dried fruit fruit, so surely would have some fructose in them? they’re really nice so I’m hoping not… any ideas on how i can find out? I had a quick look and you’re right, no nutritional panels (interesting that their recipes on their website and they include agave – so out of date – that’s just as bad as HFCS). As for the sachets, I am sure there will be some sugars in there but it cant be too much as the sachet itself is so small and once the tea is brewed there is still a lot of dry matter (leaves and peel) left in there so even if the rest of the tea bag was sugar, it can’t be all that much. It is something to be mindful of though, so don’t drink them all day every day, choose the ones that may be lower in sugars such as lemon compared with pineapple. And watch out for T2 teas. Other than being prohibitively expensive, they say no sugars but when you ask the staff they say there is sugar in there and they add extra sugar to make the demonstration teas. Love your ideas. Thank you so much. Greetings from Germany. Is soda water considered carbonated water? I love the bubbles in soda water! Yes, it’s just carbonated water. I have a machine that carbonates water and just add a slice of lemon or lime. Such a refreshing drink. Love this article and your pics! !